This page lists the software projects our group is involved in. Most of the software is hosted at bioinfweb. You can find detailed user and developer documentations to most of the projects there, if you follow the links below. Additionally formal definitions of the XML formats used in our software is privided on BioInfWeb. 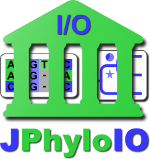 A Java library for event-based reading and writing of different phylogenetic file formats through a common interface. 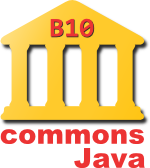 A Java library containing the shared components developed for different bioinfweb projects. These components are made publicly available under GNU LGPL 3. 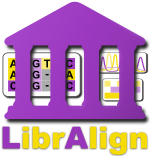 A multiple sequence alignment editor for phylogenetic purposes based on the functionality of LibrAlign and JPhyloIO. AlignmentComparator is a GUI application to efficiently visualize and annotate differences between alternative multiple sequence alignments of the same data set. TreeGraph 2 is a graphical editor for phylogenetic trees that features a variety of formatting options for the elements of a tree. Moreover, it supports several (visible or invisible) annotations (e.g. support values) for every branch or node. These annotations can be imported from Nexus tree files or text files containing data in a table (e.g. exported from a spreadsheet program). Convolutional neural networks (CNN) used to identify plants from images of leaves. Ruby on Rails application for mass assembly of primer reads generated in the GBOL5 project into contigs, auto-assignment of reads to isolates, specimens, species and management of specimens, target species, etc. GraphicMeasurer is a program that is able to analyze graphics and videos by locating and tracking objects (e.g. moving animals). The extracted geometric objects can be referenced with a spread-sheet-like result sheet language which allows to generate tables containing positions, angles or more complex data derived from the located objects. Automates encoding of indels according to 10 different schemes, including simple binary and complex matrix character schemes. Note that IndelCoder is not available for download anymore, since all its functionality has been moved to SeqState. Precursor of PRAP2. Parsimony ratchet analyses with PAUP* including random addition cycles of the ratchet and calculation of Bremer support applying the ratchet.